The last few years have witnessed a veritable boom in expenditure on experiential luxury: whether hiring a personal trainer, learning how to cook with Michelin-rated chefs such as Jean-Christophe Novelli or going on a life-changing adventure trip, the concept of spend- ing on self-enrichment has become a widely accepted feature of our lifestyles. Increased demand for experience, as opposed to hard luxury goods, has benefited the luxury travel and spa sectors enormously. For instance, the US spa sector has grown from being a cottage industry to one with annual sales of US$9.4 billion; there are more spa outlets in the USA than there are Starbucks outlets worldwide. Luxury tailor-made travel operator Abercrombie and Kent has seen its turnover almost double from £17 million in 2002 to £30 million in 2007. What has driven this expansion and what, if any, are the implications for traditional luxury goods marketers? A survey recently published by the Henley Centre found that most consumers in developed markets believe that they already have everything material they need, and that time and energy are more important to them than money. Consumers in these markets are there- fore looking beyond the tangible benefits of consumption to the intangible, such as im- proved wellbeing, self worth, education or novelty in experience. Furthermore, a big proportion of luxury expenditure in developed markets is accounted for by the baby boomer generation, which has never been healthier, wealthier or had more free time to explore new pastimes. This is in stark contrast to developing markets where the main trend is still towards “keeping up with the Chengs”, favouring displays of material wealth over shared experiences. As luxury goods have become increasingly available to wider audiences, experienced luxury consumers have looked to other means to differentiate themselves from merely affluent consumers. Shared experiences, such as holidaying in remote fashionable destinations, or knowledge of fine wines or complicated watches, have become status symbols, allowing people to identify themselves as connoisseurs as opposed to simple consumers. 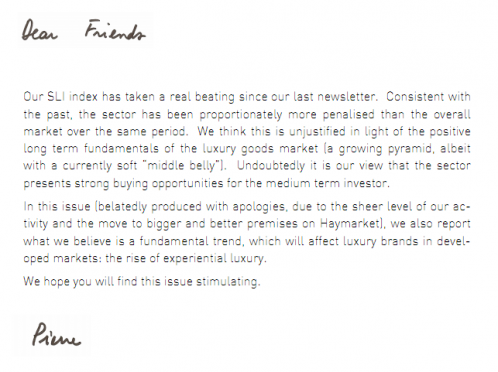 An opportunity or a threat to traditional luxury goods? Certain sector observers argue that growth in experiential luxury expenditure has been at the expense of more traditional luxury segments. We would argue that the two trends are separate. The risk of a slowdown in traditional luxury expenditure growth in developed markets is driven by wider macro-economic factors: the sector may have become more cyclical as a result of its increased exposure to affordable luxury items. The growth in experiential luxury to date has been fuelled mainly by demand from the more affluent segments of the population, who are largely immune to cyclical downturns and continue to consume traditional luxury goods as well as spend on luxury experiences. This argument seems to be supported by a number of leading luxury retailers, namely the former CEO of Barneys, who stated in a recent interview that: “they are not replacing luxury products with luxury services. The trend isn’t about replacing one thing with another. It is not a zero-sum game.” The key for traditional luxury marketers is therefore how to bring elements of experiential luxury into the traditional luxury purchasing process or how to extend their brands into this new segment. Certain sectors, such as the travel, spa and wellbeing sectors, lend themselves naturally to experiential luxury. Some traditional luxury brands have decided to extend into these categories. For example: Bulgari, Versace and Armani have all launched hotel formats, either in partnership with an operator or alone; Hilton Hotels signed a deal in 2007 with luxury spa operator Spa Chakra to roll out luxury spas at its flagship locations; Sonia Rykiel launched a yoga range, Rykiel Karma. This is the first obvious step but it carries the risk of overextending the brand into areas where it may not have much legitimacy. Perhaps more fundamentally, luxury brands also have invested in enhancing the experience of purchasing their products and continue to do so. This had traditionally come through creating an “owners club” such as the Sotheby’s New Collectors Club or the Ferrari Owners’ Site, or through the offering of bespoke services. Now it can be in the form of novel and stimulating shopping environments, such as Prada’s epicentres which not only feature innovations such as time-delayed mirrors, but also host cultural events such as concerts and art exhibitions. The key here is to enrich the brand-client relationship, creating a sense of ownership and fostering customer loyalty. Luxury brands will increasingly seek to strengthen the brand-client relationship by making it closer and more intimate, involving top-tier customers in the production process, promoting factory and brand museum visits with one clear goal: getting customers to share in the myth behind any true luxury brand, and in doing so, to own a piece of it. The SLI has dropped by 29% since its peak in early June 2007, and has underperformed the FTSE All World by 5% over the period. 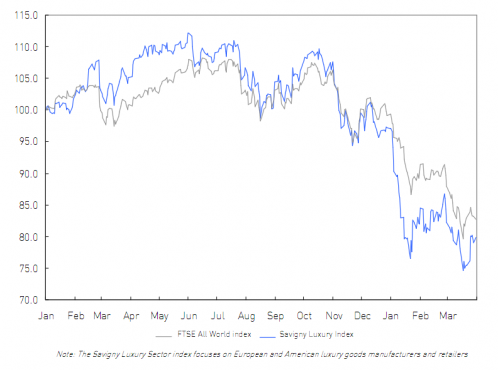 Historically, luxury stock have tended to overreact to signs of economic downturn. According to UBS, the sector derated (in terms of valuation multiples) by 35% following the 1998 slow- down and by 60% in the period from 2001 to 2003, reaching low EV/EBITDA multiples of 7-8x. This time round, the sector has been downgraded by 27% since July 2007 to an average EV/EBITDA multiple of 9.5x. Whilst it is trading above its historical lows, the jury is still out as to whether multiples have bottomed out or worse is yet to come. Market uncertainty as to the outlook of the sector has been reflected in increased volatility in share prices. Daily share price fluctuations have increased markedly in the first quarter of 2008 relative to the first quarter of 2007, with stocks recording daily percentage point changes in the high single digits to mid-teens (e. g.: Burberry +7.1% on 29 January 2008, -15.4% on 15 January 2008). The strength of the Euro continues to be a thorn in the side of luxury goods companies, with sales growth being reduced by 3 to 5 percentage points over the course of 2007. 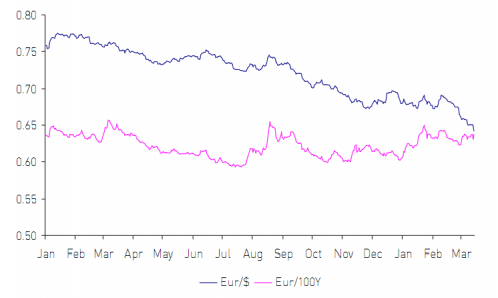 This is driven principally by the deteriorating performance of the US dollar, whilst the Japanese Yen has remained at the same level, albeit fluctuating throughout the year. This has not prevented the sector’s leaders to produce all-round strong results for the whole of 2007, driven by margin improvements and emerging markets. The underlying sales growth of the SLI constituents averaged 1 3%, with most groups reporting profit growth well into the double digits. We do not claim to have a crystal ball, and it is becoming increasingly difficult to predict the outlook for the SLI given the prevailing uncertainty in g lobal stock markets today. The spread between the high and low valuation multiples has widened considerably from 11.2-17.2x in June 2007 to 6.4-17.2x in March 2008, implying that the market perceives certain stocks to be more resilient than others. Those stocks that have been worst hit tend to share the common characteristics: exposure to affordable luxury either through brand positioning, such as Burberry and Tod’s, or through product focus, such as Safilo and Luxottica; and significant presence in mature markets, notably the US and Japan, such as Coach and Tiffany. 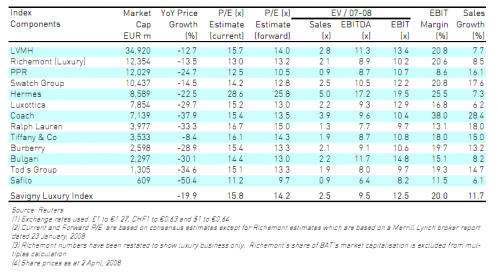 In contrast, the more resilient stocks tend to be those with a premium luxury positioning , such as Hermes; with a portfolio of strong brands, such as LVMH ; and with a diversified brand, product and geographic exposure.